Providing food, shelter and moisture, the plant life of the canyons supports and nourishes its animal life. The beauty of gnarled and ancient desert trees and the spectacle of spring wildflowers are not the only benefits for those of us who walk on two legs. Without the roots of woody and herbaceous plants to stabilize the sandy soil, harsh canyon winds would create constant sandstorms and winter rains would cause unchecked flooding. Click the plants' names to open a Wikipedia article in a new tab or window. Visually dominating open desert throughout the Coachella Valley, the creosote bush slowly grows in an ever expanding ring. One such ring in the Mojave desert is believed to be the oldest living thing on earth at 12,000 years old. 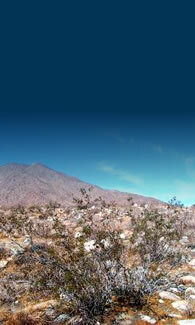 This beautiful native palm, with its graceful skirt of dead leaves, gives Palm Springs its name. Clustered in areas of groundwater such as the Chino Canyon cienega, it also grows by streams in the Indian Canyons. Another of the visually dominant plants of the canyons, brittlebush's silvery blue leaves are an adaptation to reflect heat. Its brilliant yellow flowers are held high above the foliage, creating a brilliant color display when in bloom. Slow-growing to about three feet tall, these cacti and similar species are well protected by recurved, fishhook-shaped spines, often in brilliant shades of red or pink. Flowers in various colors are followed by large, fleshy fruit. Easily detached, barbed spines, which can become embedded in skin, make this cactus one of the region's least friendly plants. Chollas are closely related to the genus Opuntia, also known as pad cacti, nopales or prickly pears. Taking five or more years to bloom, this yucca's inflorescence is up to ten feet tall, bearing hundreds of densely packed, bell-shaped, white or purplish flowers. Dead flower stalks stand like lonely sentinels in the rocky upper canyon. All photos credit: Tom Brewster Photography unless otherwise specified. Plant photos courtesy of Wikipedia.